Nebraska Shakespeare creates entertaining, challenging productions as well as immersive educational experiences that connect our diverse community to Shakespeare's exploration of what it means to be human. On stage, in the classroom, and through collaborative partnerships, we CREATE, ENGAGE, and INSPIRE. At Nebraska Shakespeare, we believe that Shakespeare’s life-affirming works are essential to broadening the cultural and educational environments of our community and strive to produce innovative professional Shakespeare productions and educational forums. 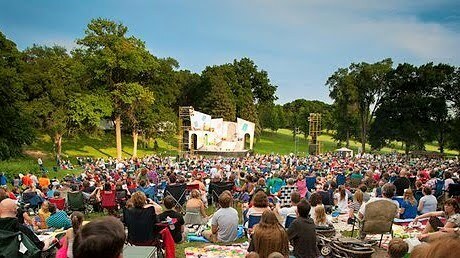 Nebraska Shakespeare Festival, Inc. is a nonprofit organization that was founded in September 1986 and performed its inaugural Shakespeare on the Green production in June of 1987. Our vision is to find ways to make Shakespeare a part of our society beyond the literature and drama classrooms and, for this reason, we provide opportunities for continued interaction and learning about the bard that are both free and accessible to a diverse audience. We are focused on delivering experiences that are true to the text and intent of Shakespeare while creatively and dynamically relevant to contemporary life. Our success is achieved through collaboration with Creighton University, University of Nebraska at Omaha, the City of Omaha, generous benefactors, talented artists, seasoned staff and 200+ dedicated volunteers. We serve over 40,000 individuals annually through quality theatrical performances and educational programming including scholars forums, our fall performance and educational tour encompassing over 70 communities throughout Nebraska and Western Iowa, Camp Shakespeare for students ages 8 - 18 and a sonnet writing contest for students and adults. We value engaging and bold experiences. At the heart of our mission are unforgettable productions that inspire the artists and audience alike, including our acclaimed summer season, traveling productions for families and students in the fall, and poignant readings and performances throughout the rest of the year. We value ongoing exploration and discovery for all members of our company and community, from the newest to the most experienced. Nebraska Shakespeare works with schools and communities year-round to create impactful programs and ongoing connections with students. Nebraska Shakespeare is happy to be a part of bringing together families, students, businesses, and social clubs to enjoy experiences true to the text and intent of Shakespeare while dynamically relevant to contemporary life.